Which putting green turf is right for your backyard? Now, many new homes have a green space in the backyard. You can conveniently have the artificial grass installed to improve the design features of your home. They are suitable for all kinds of terrain and land shapes. 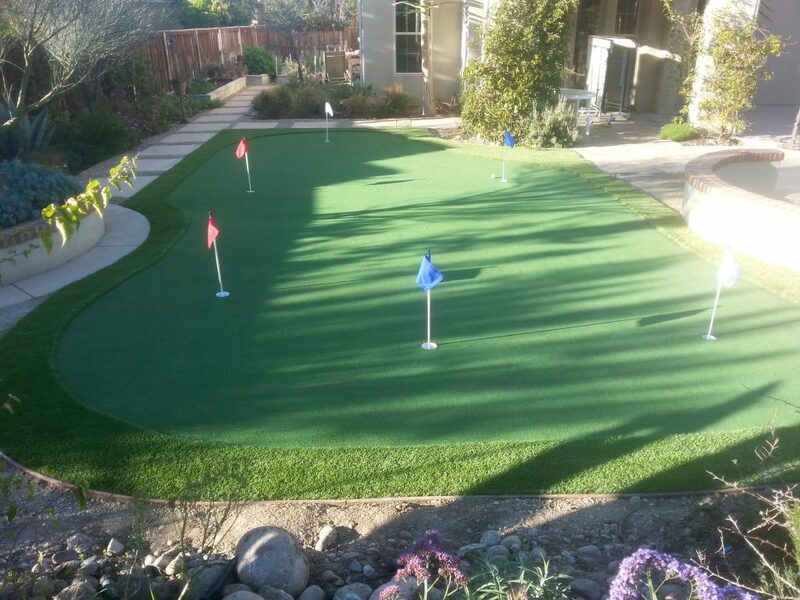 When considering getting putting greens installed, call the best synthetic putting greens turf installation company in San Diego to get the job done. There is an old adverb which has the popular slogan “Better living through chemistry.” While the slogan was not attributed to the development of artificial grass at that time, it is now apparent that a lot has been achieved through the knowledge of chemistry and technology. The old and original Astro Turf has become a beautiful and realistic synthetic turf which has been designed to serve different purposes, such as golf putting greens turf, pet turf and playground turf. Currently, in the marketplace, polyethylene is the best material for these artificial lawns and other installations regarding landscaping. It gives the same feeling of walking barefooted on grass which is as essential as the beautiful emerald color it has. These artificial grass brands have very similar features with the natural grass you can find anywhere. And it is very convenient to have around your home regarding caring for the space. Installing artificial grass in any space automatically turns the space into the perfect place for your children or pets to play. The cut patterns on the grass make it easy for a ball to roll smoothly on the grass. Some artificial turfs are made of nylon, however, the most reliable products for the best results are made from polyethylene or polypropylene. One option has been developed for casual golfers who wish to play in the comfort of their homes. It is made of artificial polypropylene grass with short blades which have a minimal sand infill to make golfing slower. It is also easy to install, no need to roll this grass and it is affordable. You can also use it for the backyard bocce, or a croquet court which features connectors beneath the turf to set the posts and wickets. Another option is recommended for frequent golfers. It is made from polyethylene. The grass on this product is smaller and has a san/rubber infill. It is also faster for the balls. This product looks more realistic too, the stimp speed is usually 9 or 9.5, but you can roll it to reach 12. On this product, you can get a consistent chipping performance up to 120 yards. This option, however, may be a bit more expensive. These are just several options to consider when buying an artificial grass for your home putting green. To get your free artificial grass estimate today, or if you have any questions about our great service, contact the professionals at the top artificial grass and synthetic turf installation company in San Diego.